Most Fridays we get take out from our local Thai restaurant, Lemongrass, and sometimes we stop at a convenience store on the way to see if there are any interesting or new beers (and sometimes wine) available. 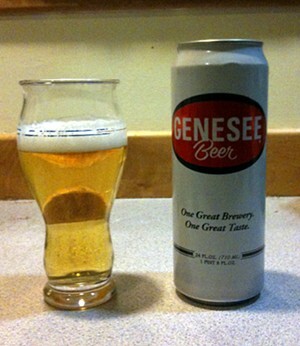 Yesterday I saw one of these, a 24-ounce can of Genesee Beer. A couple years ago I found a six-pack of Genesee Cream Ale at Goldhill Liquor, but I haven’t seen straight-up Genesee since I left Rochester a couple decades ago. Needless to say, I bought it, and am now very much enjoying the refreshing, light taste, with just a bit more than a hint of corn in the flavor. My favorite homebrew, Piper’s Irish-American Red Ale also has this subtle corn flavor. Corn (and later, rice) have a distinct place in American brewing history because it was a way to reduce the excess protein found in the 6-row barley that grew well in North America. By contrast, the traditional European brewing grain, 2-row barley, only has enough enzymes (protein) to convert it’s own starches to sugars, so there wasn’t a problem with excess protein in the final beer. With 6-row grain, there are enough enzymes to convert additional brewing adjuncts like corn, reducing the protein content in the final beer (and also, incidentally, making the beer cheaper to produce). Genesee Brewing has been in continuous operation (except for during Prohibition, of course) in Rochester, New York since 1878, and is still an independently owned brewery that’s part of the North American Breweries name (along with Labatts, Pyramid, MacTarnahan’s and a few other small breweries). If you’re going to drink an American light lager, it might as well be a good one like Genesee instead of the mega-industry, foreign-owned, over-commercialized swill like Budweiser, Coors, Miller, etc.